Flor de Sal, our Pura Vida Sea Salt, also known as “Maya Sea Salt” and “White Gold”, is hand harvested in Guatemala. Harvesting of this salt dates back as early as 1000 B.C. – it is estimated that ancient Mayans brought 3 to 6 tons of sea salt inland every day by canoe or on foot in order to maintain their supply of this essential resource. We purchase our Pura Vida Sea Salt directly from the exclusive importers of this special salt, which supports economic growth for the people of Guatemala. Pura Vida Sea Salt is a 100% natural, gourmet food salt that adds mild, savory flavor to any meal. HAND HARVESTED IN GUATEMALA - Our Flor de Sal is a hand harvested salt in Guatemala by skimming the top of the sea water, collecting only the salt crystals that form on the surface. This luxurious sea salt is perfect for finishing and garnishing food, as it is naturally fine grain with a mild flavor and a naturally high moisture content. 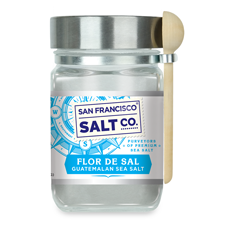 THE ULTIMATE CULINARY SALT - The unique, natural texture and moisture of Flor de Sal Sea Salt make it the one of the most favored salts by professional chefs. The high moisture content and crystalline shape of Flor de Sal make it the ultimate finishing salt, because they cause the salt to linger for longer in food without dissolving, which gives meals both the delicious flavor and satisfying crunch that Flor de Sal is known for. AN ESSENTIAL INGREDIENT FOR PROFESSIONAL & HOME CHEFS ALIKE - The perfect finishing salt, our Flor de Sal Sea Salt perfectly complements a variety of foods such as Steak, Buttered Toast, Caramels, Toffee, Salads, Eggs, and more! 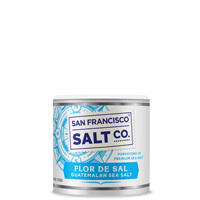 BUY WITH CONFIDENCE - The San Francisco Salt Company is confident that you will be happy with the quality of our products and stands behind every single item that we sell. San Francisco Salt Company is a trusted supplier of salt since 2002. DESCRIPTION - Flor de Sal de Guatemala. Packaged in our U.S.A., GMP certified packaging facility which is 3rd party audited by SCS Global. PROPERTIES - Our Flor de Sal is Kosher Certified, Non-GMO, and does not contain any MSG, Soy, Gluten, Dairy, or anti-caking agents. We package in our U.S.A., SQF Quality code compliant facility. INGREDIENTS - Flor de Sal Sea Salt.